Since my last blog, I started competing on my race-ready Sensa Dura (this is an old post and the linked content no longer exists) at my club TT. Time trail is pretty new to me but I love it. I’m starting to refine my skills, gain valuable experience and at the same time I’ve been getting some good times and results. I’ve enjoyed doing plenty of circuit road races with top 10 finishes, my best result so far being 4th in a National B circuit race at Darley Moor before resting up. 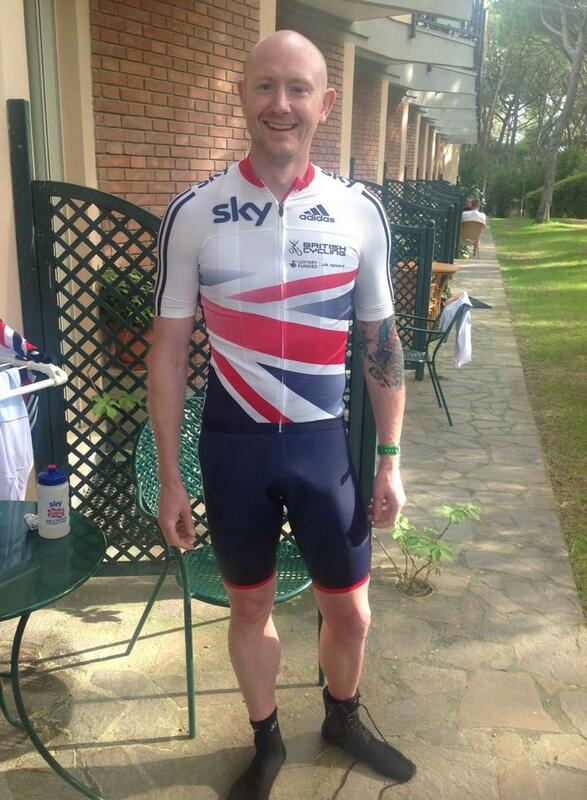 I then headed off to Castiglione Della Pescaia, Tuscany, Italy for the first UCI Para-cycling Road and TT World Cup of the season with Team GB. Travelling with Team GB as a development squad rider is a fantastic experience and I was given my first Team GB ‘Podium’ kit, usually only reserved for those riders from the Podium programme. I competed for Team GB at the Italian World Cup on the 2 year anniversary of the accident that caused my permanent injury enabling me to be a C5 rider. This competition held both emotional significance for me and immense pride. 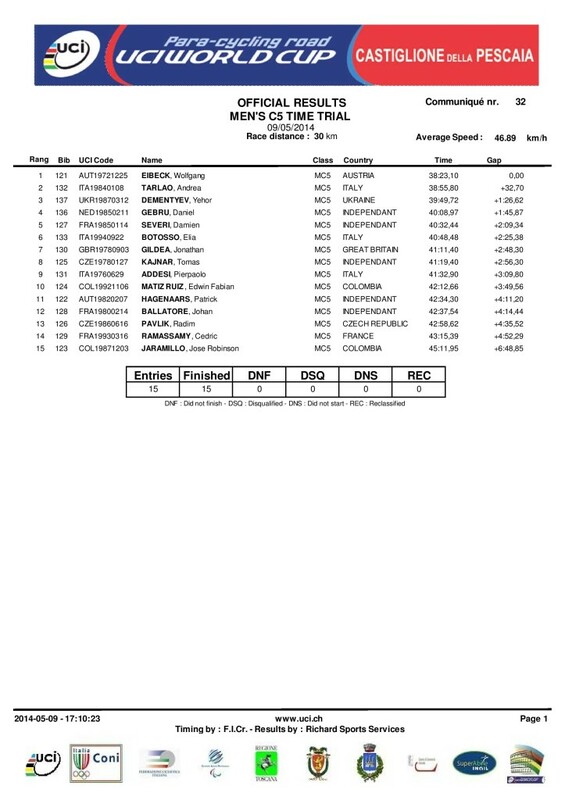 The World Cup event itself held mixed results for me with 7th in the TT. But the day after, during the road race, I was bought off by the tail end of a big crash so I was unable to finish. ‘Lucky’ for me I escaped the crash with only a dislocated shoulder and a smashed helmet. It was a fantastic experience though and gave me a good idea of what I am up against for the forthcoming international races during the season. Having raced against the best riders in the world I returned home after the event with the determination that I have what it takes to get to the very top in my category. It was also very positive that I scored valuable points for Team GB qualification towards places in Rio. The big focus for me now is looking towards my next international opportunity in Nottwil, Switzerland on 24th and 25th May. This will also be the home to the 2015 Para-Cycling Road World Championships so is a great opportunity to push for an improved TT result and a Road Race place. As well as clocking up more international experience I also have to work towards attaining enough points for my 1st Cat licence. I intend to keep you all informed of my progress throughout the Team GB Paracycling Development Programme and help answer any questions that you may have about my experience. I’m on Twitter as well as Facebook, if you’d like follow my progress please say hi and help to cheer me on! Tagged merlin athletes, paralympics, pro, pro cycling, pro racing, team merlin. Bookmark the permalink. Well Done doesn’t seem adequate Jon! Thank you for taking us all on such an amazing journey with you- although its as scary as its exciting at times we wouldn’t miss it for the World! Your in your “flow” so enjoy every second!